Fond of clamping stuff on to other stuff? Well, if that’s your thing, you’re in luck, because Kinsman has come out with a new range of practical clamp-on holders for your every musical need. 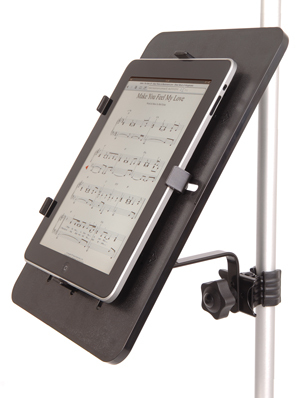 This is the iPad/Tablet Clamp (KIP01 – particularly useful for forgetful singers who may wish to have lyrics on hand while they’re at the mic! Besides clamping on to a mic or cymbal stand, you can use it free standing on the top of your piano or in the studio because it’s also got a handy flipout back stand. All the Kinsman clamp-on holders come in a classy black finish, have a very firm grip and they’re strong enough to take whatever weight you throw at them, time and time again.